chick pea salad recipe... very easy and special salad delicious fresh taste, i cook it sometimes . Soak chick peas in warm water overnight. Boil chick peas in a saucepan with a lot of water. Strain the chick peas and puree them. 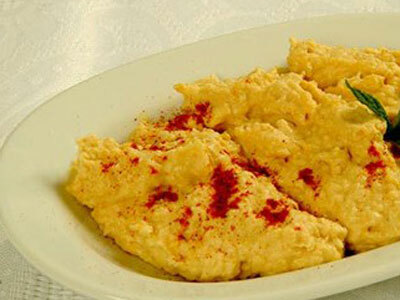 Blend the sesame oil with the puree of chick peas. Add lemon juice to the mixture until its taste becomes sour. Add the red pepper and salt. Mix the salad well so that it is liked mashed potatoes. Put the salad into a serving dish and add a dressing of olive oil and red pepper before serving. Beetrood salad recipe, turkish recipe..
Turksih Kisir recipe with bulgur..
Cover the bulgur with boiling water, set it aside. The water and the bulgur should be at the same level. While you're busy with chopping all the veggies the bulgur absorbs the water. Mix the paste and the spices thoroghly. After that just add the veggies. You can use lemon and vegetable/olive oil as dressing. Chick pea salad recipe Turkish salad recipes..
Peel and dice the cucumbers. Put the cucumners in a bowl. Pound the garlic cloves in a mortar with 1 teaspoon of salt. While whipping the yoghurt with a fork or whisk, pour in 1/2 glass of water gradually and mix with yoghurt. Add the cucumbers and garlic to the yoghurt abd mix again. Put the olive oil, vinegar and ice cubes into the bowl. Decorate the salad with chopped fresh mint leaves or dried mint. turkish Pumpkin dessert is a special and exotic desert. * 1 medium pumpkin skinned and cut into slices. Put the pumpkin pieces into a big sauce pan. Cover the pumpkin with as much sugar as possible and let it rest overnight. Boil the pumpkin with the juice and the sugar over medium heat about 45 to 60 minutes. Cool it before serving. Serve with walnuts garnished on top. Clean the stalks and stones from the bulgur, wash several times and cook in plenty of water until it becomes a mush. Remove from heat, cover with a piece of cloth to keep warm and let it stand overnight. Strain the mush which is almost solidified through the strainer. In another bowl dissolve the bread yeast in warm water, strain and add to the bulgur. Add the sugar and put in a glass jar or glazed pan, close to lid tightly. Once in a while stir with a scoop. After 3-4 days a not too sour boza will be obtained. Put the boza in glasses, sprinkle cinnamon over and serve along with roasted yellow chick peas (leblebi). Put the margarine and sugar into a bowl and knead until the margarine turns white. Add the flour while kneading to make into a dough. From dough into a long round shape on a wooden board, cut into pieces of desired sizes, form pieces into balls and place on greased baking sheet leaving 1 inch between each. Put in moderately hot oven to bake for 30 minutes. Make sure that the tops do not brown too much. Place biscuits on serving plate, frost with icing sugar and serve when cool. SYRUP: Put the sugar, water and lemon juice into a saucepan, and after melting the sugar by stirring, allow it to boil until moderately thick. Set aside to cool. PASTRY: Heat the margarine in a saucepan, add the water and salt and bring to the boil. Reduce heat and add the flour at once. Stir the mixture constantly for 7 minutes with a wooden spoon. Remove from the hit and set aside to cool. When cool, add the eggs and egg yolk and knead or 10 minutes. Take walnut sized pieces of the pastry and form into finger shapes with hands wetted with olive oil. Put shaped pastry into a pan containing warm olive oil and fry over a low heat until it puffs up a bit. Turning the heat up to moderate, continue frying until golden. Remove pastry with a perforated spoon, straining out, the oil out and put into the syrup. 15 minutes later, take vezir's fingers out of the syrup. Place on serving dish and serve. Melt the margarine in a pan, add the pine nuts and semolina, and saute over heat a little less than moderate for 40-50 minutes while continuously stirring until the colour of the pine nuts changes. Add the milk and stir well, add the sugar and continue to stir. Cover the pan and cook over low heat for 20 minutes. Remove the pan from heat, allow to cool for half an hour, stir the helva thoroughly with a spoon, put a plate and serve. Heat the margarine in a saucepan very gently, and saute the flour until golden brown in the margarine for 40 minutes over low to moderate heat. When the flour turns light golden, put the sugar and water in a seperate saucepan and make a syrup by boiling gently. Add the syrup to the saucepan with flour and simmer for 20 minutes, then take out small pieces of the helva with a wooden spool, form into balls and place on a serving plate. Serve warm. Fried pastry with syrup is very delicious and special taste. it is well known and very cheap but quality desser. it is called Tulumba tatlisi in turkish. Put the sugar, water and lemon juice into a saucepan, and after melting the sugar by stirring, allow it to boil until moderately thick. Set aside to cool. PASTRY: Heat the margarine in a saucepan, add the water and salt and bring to the boil. Reduce heat and add the flour at once. Stir the mixture constantly with a wooden spool and continue until mixture leaves the sides of the pan and forms a ball. This should take 6 minutes, then remove pan from heat and set aside to cool. When cool, add the eggs and knead for approximately 10 minutes, using a pastry bag with a large nozzle, put 7-8 pastries in a pan containing the heated olive oil. Start frying the pastry over low heat, increase heat when pastry puffs up a bit and fry until golden. Remove fried pastry with a perforated spoon, draining away the oil, the put into the syrup. Strain off the syrup, place tulumba on serving plate and serve cool. 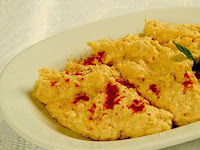 Tel Kadayif with walnuts recipe. Flake kadayif and place on a shallow cake pan, sprinkle crushed walnuts over evenly and spread the other half of the kadayif on top. Sprinkle melted margarine over and place in moderate oven to bake for 40 minutes. SYRUP: Meanwhile, put the granulated sugar, the water and lemon juice into a saucepan and boil until moderately thick. When golden brown, take kadayif out of oven and sprinkle boiling syrup over immediately. Cover and allow to cool. When cool, place a plate large enough over the top of the pan and transfer kadayif onto the plate by turningit upside down. turkish recipes: firstly soak the beans overnight in cold water. Drain and put into pan containing 12 glasses of boiling water. Lower the heat a little and coook for 30 minutes until the color of the beans changes. Remove from the heat and drain. Put olive oil and chopped onions into a pan and saute. Scrape the carrot amd slice in circles 1/2 inch thick. Add the carrot, the potato cut into small pieces, celeriac, garlic, sugar, 1/2 tablespoon of salt and the beans. Pour 4 glasses of water over, close the lid of the pan and cook over heat little less than moderate until tender. Remove from heat, place on a plate after they have cooled down, sprinkle chopped parsley over and serve. Soak the chick peas in water overnight and boil them next morning. If you are going to use a tomato in the soup, peel and grate the tomato. Put the chick peas, the meat broth, the grated tomato or the tomato paste and 1/2 teaspoon of salt into the saucepan and boil. Add 1/2 teaspoon of salt and black pepper to the ground meat and knead it. Make small meatballs of almost hazelnut size and put them in the boiling soup. Let soup simmer for 20 minutes more. Remove saucepan from heat, add vinegar and, if desired, thyme, and stir before serving. another delicious turkish soup.. easy and delicious fresh soup..
Chop the onion, put into a saucepan with 1 tablespoon of margarine and saute. When onion is semi-sauteed add the flour and mix well. Wash the lentils, chop the carrot and put them in the saucepan. Pour the broth and water into the saucepan, add salt as desired and cook the soup for 30 minutes until the lentils are pasty. Strain the soup and pour it back into the same saucepan. Bring to the boil. Meanwhile blend egg yolks with milk well in a bowl and mix this into the soup. Remove saucepan from heat after 2 minutes. The soup is now ready to be served. Cut 4 slices of white bread into cubes. Fry bread in a pan with 2 tablespoons of margarine. Drain off the margarine and put the bread cubes (croutons) on the soup. Firstly put margarine and flour into a saucepan and place saucepan on heat. Then saute flour until it becomes golden. Laterly peel the tomatoes and chop them. Put tomatoes, the broth and salt into the saucepan. Almost 35 minutes later, when the tomatoes are cooked, pour the soup into another saucepan straining it at the same time. Bring to the boil. Blend the yolks of aggs together with the milk in a bowl. Lastly add this mixture to the saucepan and serve the soup. Cut the fins off the fish and scrape off the scales. Remove the gills and the gut. Wash the fish thorougly under running water. Grate the onion. Chop the parsley. Scrape and grate the carrots. Cut the peeled celeriac and potatoes into small pieces. Wash the rice. Then put the fish in a wide saucepan, put the grated onion and chopped parsley on top of it, and add salt as desired. Pour the water into the saucepan and place it over a moderate heat. Boil the fish until it becomes tender. Take fish out of the saucepan with a skimmer and put aside. Put the carrots and potatoes into the saucepan. Add the rice to the saucepan and let it boil until the soup becomes somewhat jelly-like. In the meantime take the skin and bones off the cooked fish and cut the fish into big pieces. When the vegetables and rice are thorougly cooked, strain them and put them in a seperate saucepan. Heat the saucepan containing the soup and add salt if necessary. When the jelly-like soup begins to boil, put the fish into the saucepan and let it simmer for 5 minutes. Lastly whip the lemon juice and eggs in a bowl. Take spoonfuls of the soup and add it to this sauce while stirring constantly. When the bowl is full, pour it back into the saucepan while stirring the soup. Remove saucepan from heat, pour it into a serving bowl, add some black pepper according to taste and serve. Firstly take the garbanzo beans and soak them overnight then boil them for about 35–40 minutes after that strain them and put aside. Secondly in a food processor or blender add about enoutht water and all the remaining ingredients, pureing them until they make a thick paste. Put a couple of tablespoons aside to use for plating at the end. Lastly taste the hummus and if it's too thick add some water, pepperocini brine, or lemon juice. bone appettide..